​The Cabri facility is a pool-type research reactor (basic nuclear facility n°24) operated by CEA and located in the Cadarache site in southern France. It is intended for the study of envelope accident situations for certain reference accidents considered in the safety analysis of pressurized water reactors (PWRs). 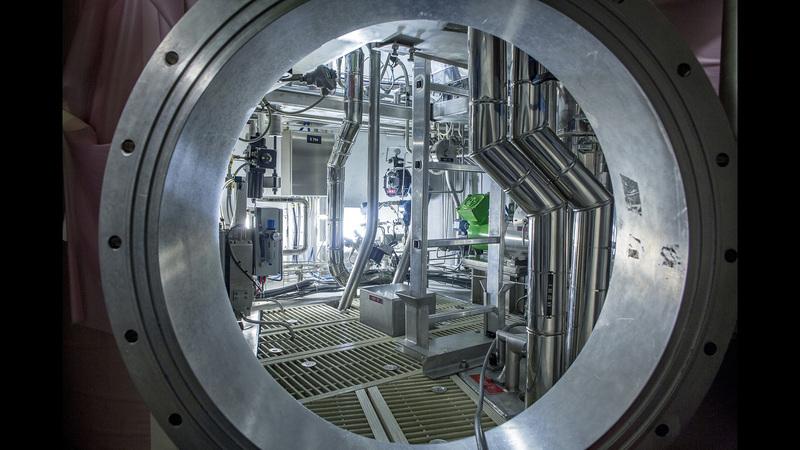 In its current configuration1, the CABRI research reactor is used to simulate a sudden and instantaneous increase in power, known as a power transient, typical of a reactivity-initiated accident (RIA) and which must be considered in the safety analysis of PWRs. More specifically, it is used to study the behavior of fuel rods and their possible rupture during these accidents. With its partners, IRSN identifies the tests which best reproduce the conditions of such accidents for testing the fuel in question. It funds the experimental programs and operates the Cabri reactor in which the test are performed by a joint IRSN/CEA team. IRSN also carries out pre- and post-test examinations on the test rod. (1) In the future Cabri may be adapted to the study of fuel rod behavior during a loss-of-coolant accident (LOCA). 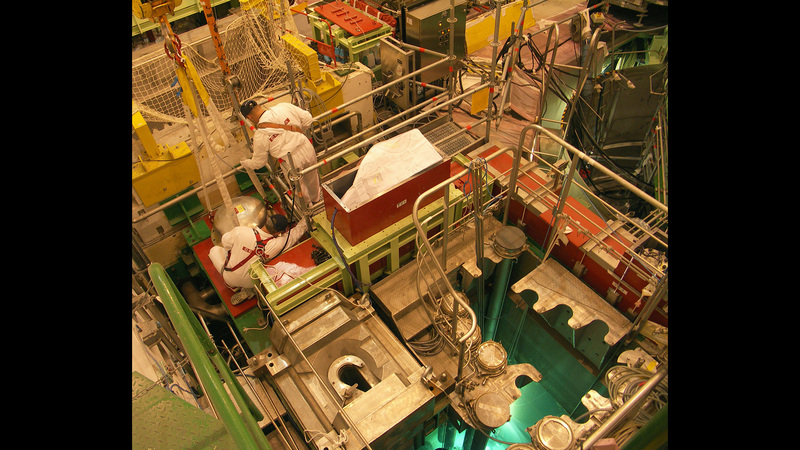 ​General view of CABRI reactor hall. 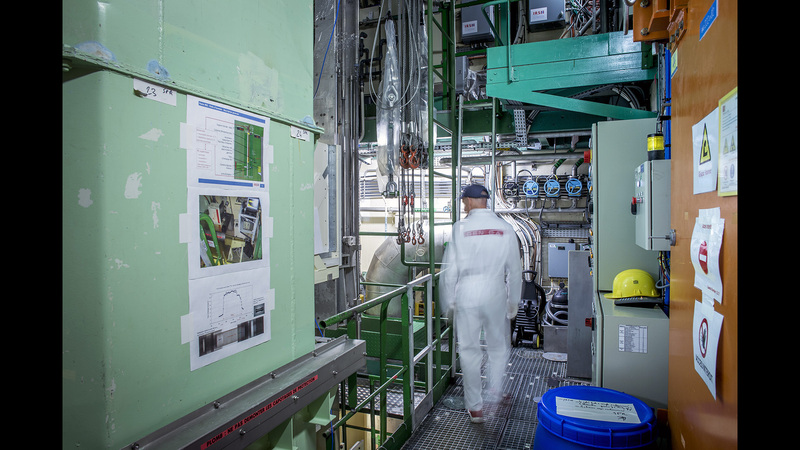 ​IRSN funded and CEA oversaw a major 12-year refurbishment of the facility (2003-2015), which included a safety upgrade (for seismic and fire risk) and numerous improvements to functionalities, including refurbishment of the reactor core cooling and waste systems, refurbishment of the core block and fast valves of the transient rods, and replacement of nuclear ventilation and equipment and facility control/command. Several equipment were replaced (test device handling cask and transport shell) or renovated (IRIS nondestructive station, seismic reinforcement, and the hodoscope). In terms of experiments, the most significant modification is the replacement of the sodium test loop with a pressurized water loop in order to reproduce the thermal hydraulic conditions of a pressurized water reactor (280°C, 155 bar, speed of water at test rod 4 m/s), which is the type of reactor found in nuclear power plants in France. With a maximum power of 25 MW in steady state, the driver core, composed of 1,487 UO2 rods (enriched to 6%) with stainless steel cladding, is very compact (65 cm on the side and 80 cm in height). In static state, it is commanded by 6 hafnium control rods (6 groups of 23 natural hafnium rods). The experimental pressurized water cell, which includes the device containing the test rod subjected to the power transient, passes through the middle of the core. An irradiation channel also passes horizontally through the driver core so that a specific device, called hodoscope, can measure the movements of the fuel during the power transient in real time. After the test, these direct measurements are supplemented by nondestructive examinations on the test rod performed in the IRIS station (gamma scanning and X-ray imaging). Upper view of CABRI reactor pool. 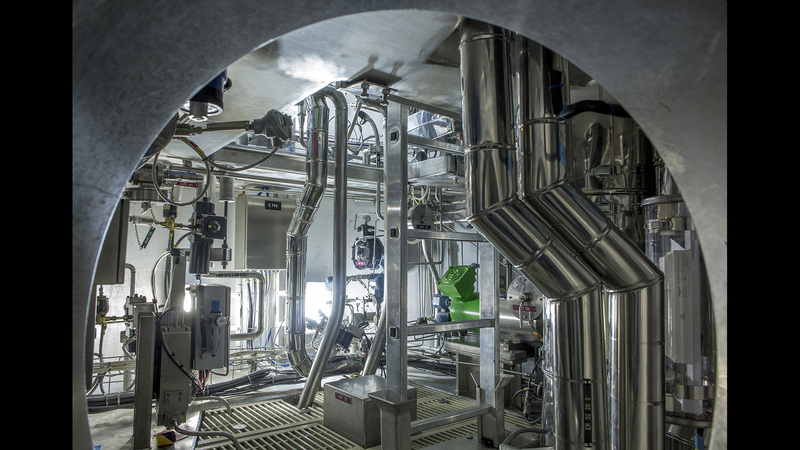 ​One of the main particularities of the reactor is its reactivity injection system which is used to perform the power transient. The type of reactivity-initiated accident considered for a PWR as part of safety assessments is the ejection of a control rod following the failure of a drive mechanism casing due to the difference of the pressure between the inside of the vessel, 155 bars, and the outside, which is at the ambient pressure of the reactor building. The very rapid increase in reactivity which results is recreated inside the Cabri reactor using four “transient rods” located in the core. Each transient rod is composed of 24 tubes which cover a reduced fuel assembly of 5×5 UO2 rods. A collecting head brings the 24 tubes together into a line (Figure 3), fairly long depending on the position of the rod in the core. The four lines come together at a single collector. Two gas letdown trains exit the collector, each one equipped with a fast on-off valve and a control valve for adjusting the letdown flowrate. The downstream letdown line leads to a vacuum tank. 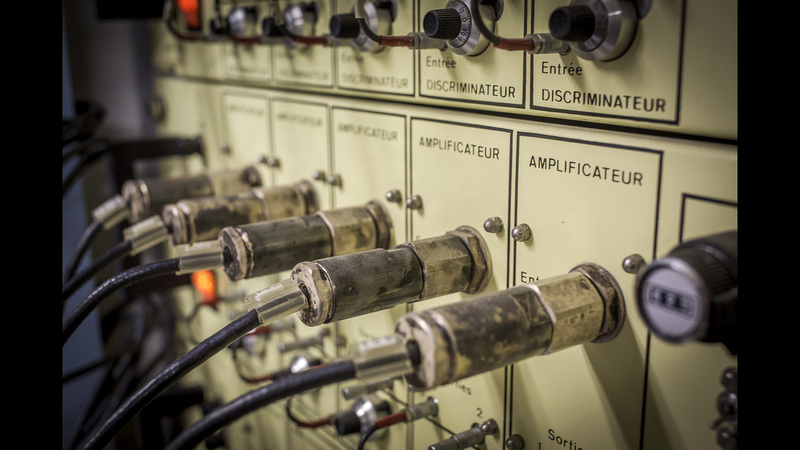 CABRI reactor control rooms. 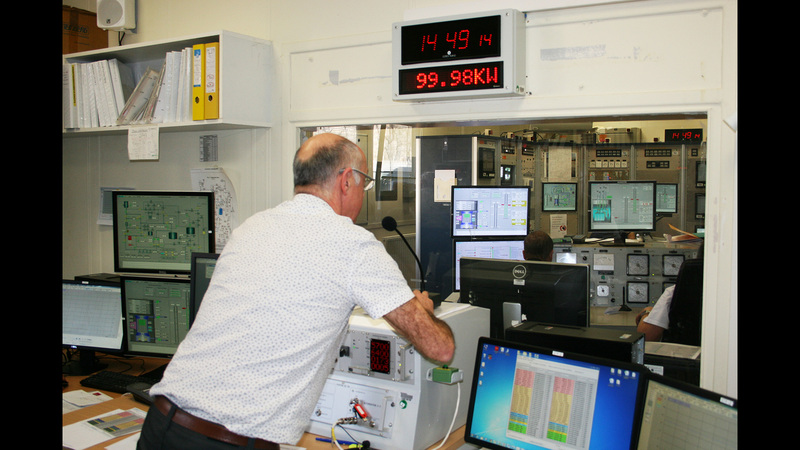 The tests parameters are controlled in the first room; the reactor is operated in the second room, seen through the window. ​Before the test, the transient rods are filled with helium-3, a neutron-absorbing gas, at a pressure of approximately 10 bar. The power transient is generated, when the reactor is at a virtually nil power level (100 kW, typical of hot shutdown of a PWR), with controlled opening of the fast valves so the helium-3 under pressure can escape; this results in a sudden increase in reactivity (since the neutrons are no more absorbed) and thus to a power peak (or pulse). This is immediately limited by neutron counter-reactions, primarily Doppler effect, and then terminated by the controlled dropping of the control rods in order to adjust the energy delivered to the test rod. During the power transient, the neutron safeguards of the reactor are inhibited for 1 second. The pulses last from several milliseconds to several tens of milliseconds (characterized by width at mid-height between 8 and 80 ms), with total instantaneous power that can exceed 21 GW, and energy deposited in the core reaching 237 MJ. 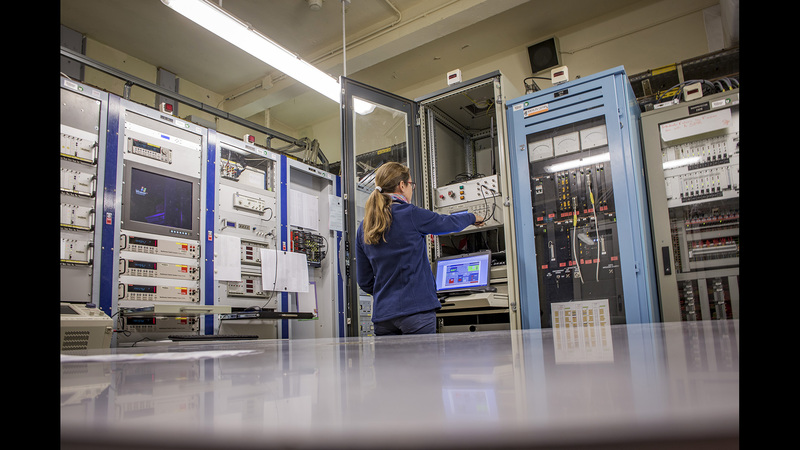 The test director operates the digital and analog system for control of transient rods, which controls the transient rod depressurization process. ​The pressurized water loop is a test loop passing through the center of the Cabri core. The pressurized water loop replaces the previous experimental sodium loop. Its role is to house the test device and create the thermal hydraulic conditions around the test rod that are those of a PWR: 280°C, 155 MPa and a maximum flowrate of ~4 m3/h. The pressurized water loop thus constitutes the first safety barrier of the facility with regard to the rod being tested. The part of the pressurized water loop located at the center of the reactor is termed the in pile pressurized water cell. It is connected to the out of pile containment vessel which houses all of the components producing PWR thermal hydraulic conditions (pressurizer, circulation pump, heat exchangers) and the related systems of the pressurized water loop (relief tank, systems for managing liquid and gas effluent generated during testing, etc.). ​Inside view of the out of pile containment vessel. ​Since water in the pressurized water loop may be contaminated, it is placed in a double shell, which constitutes the second containment barrier. The loop includes a filter for trapping fine fuel fragments that may have been released (to protect the pump and limit source term in the effluent). The part at the core of the double shell is known as the security tube. The assembly containing the security tube and in pile pressurized water cell is the pressurized water cell. The containment and security tube are made of Zircaloy-4 to optimize neutron transparency around the test rod. The part of the pressurized water loop connecting the in pile pressurized water cell to the out of pile containment vessel has lead shielding for radiation protection. ​Inside view of out of pile containment vessel. ​The hodoscope is another specific feature of the Cabri facility. IRSN’s almost unique measurement equipment² monitors the movements of the test rod fuel in real time. The hodoscope is located in the axis of the reactor core. The collimator channels neutrons from the test fuel to the detectors. 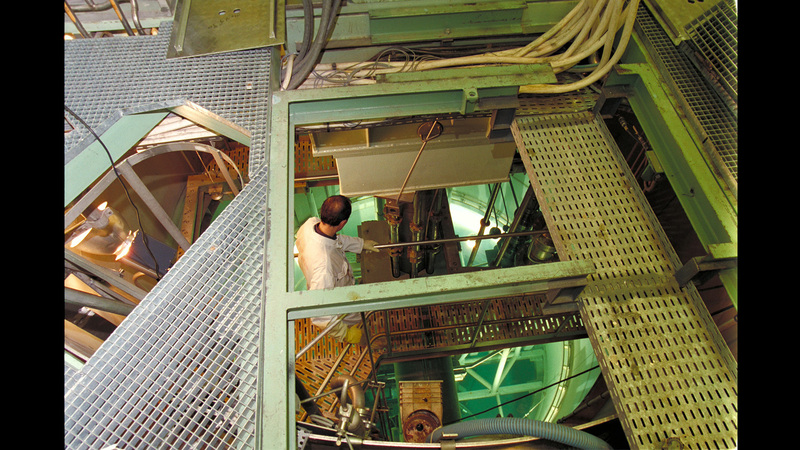 The collimator crosses the reactor pool inside a leaktight sleeve towards the test cell in which the test fuel is located. Rotations of the collimator are used to align it on the test rod. Its characteristics: 3 meters long, 5 metric tons and the front side of the collimator is 1,020 mm from the core axis. 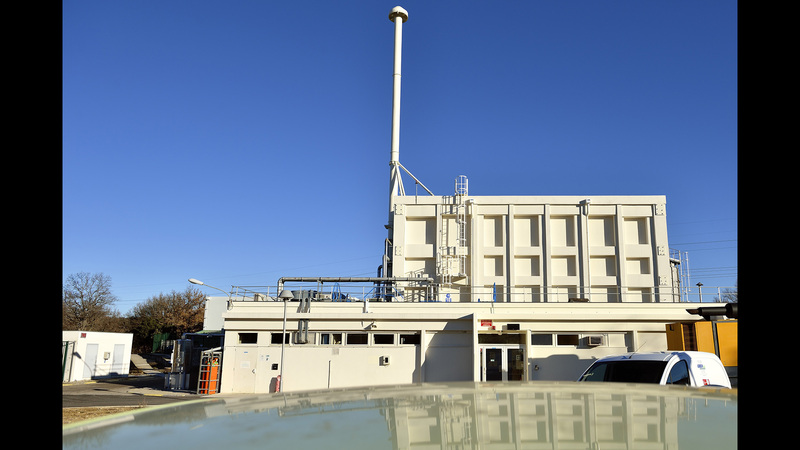 (2) The Transient Reactor Test (TREAT) facility at the Idaho National Laboratories in the United States is also equipped with a hodoscope, but it has not been in use for a number of years and its detectors have a different design. 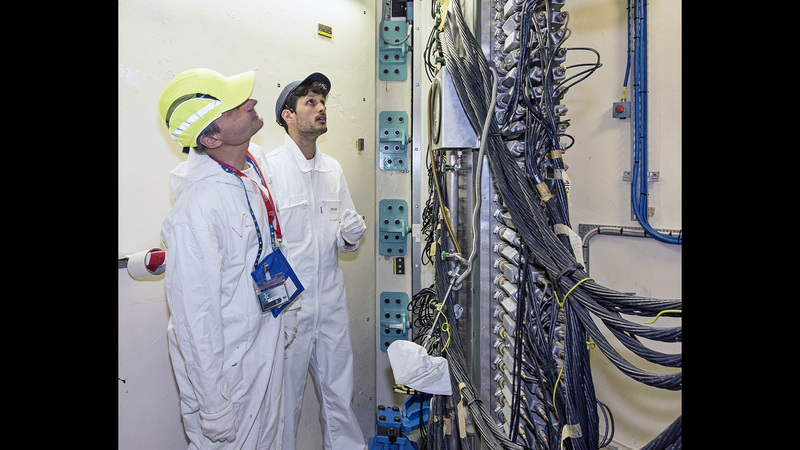 ​Two engineers from IRSN, Vincent Chevalier (on the left) and Salvatore Mirotta (on the right), examine the hodoscope set-up on CABRI reactor. The collimator corresponds to a matrix of measurement windows over three columns each having 51 rows for a total of 153 measurement windows (picture on the left). 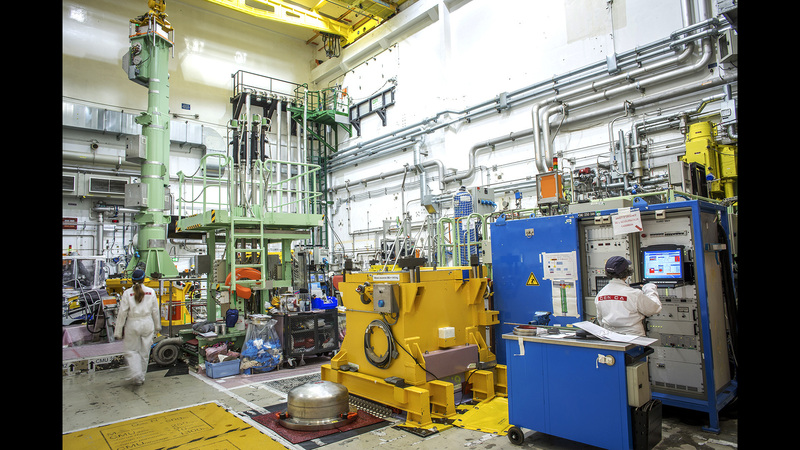 Each window (picture on the right) includes a recoil proton counter and fission chamber for a total of 306 neutron counting tracks. The detectors sense only rapid neutrons from the test rod at a maximum acquisition rate of 1 ms. The hodoscope thus provides the power profile of the test rod in real time. It measures elongation and detecting any relocation of the fuel. 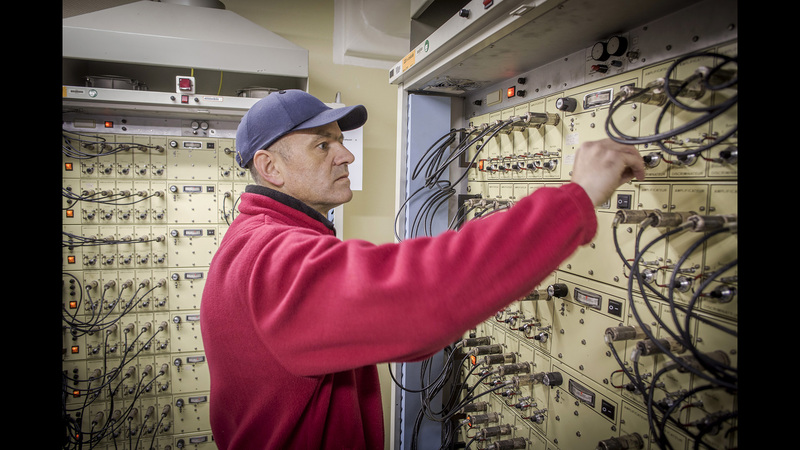 ​Jérôme Guillot, head of L2EP in charge of CABRI tests, in the hodoscope data acquisition room. 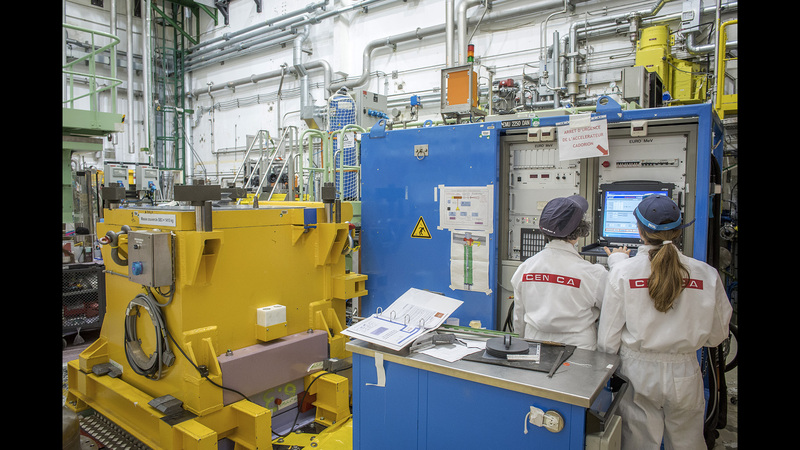 IRSN’s facility for radiography, imaging and spectrometry (IRIS) is a measurement station for nondestructive examinations of rods tested in the Cabri reactor that supplements the direct measurements of the hodoscope before and after the test. The objectives are to characterize the degradation of the test rod following the power pulse and to quantify the distribution of fission products. For this the IRIS station includes a shaft that is 1-meter square and 11 meters deep with a motorized sleeve in which the device containing test rod is inserted. An elevator is used to move the device in front of two examinations lines of sight (gamma scanning line of -5 m and X-ray imaging line of sight at -8 m). Two types of nondestructive tests are performed on test rods in the Cabri reactor: gamma scanning and X-ray imaging measurement. ​Two experimenters from L2EP, Nathalie Monchalin and Léna Lebreton, in front of the local control station of the IRIS station accelerator, in CABRI reactor hall. Quantitative measurement of the linear gamma activity profile of the fission and/or activation products found in the test rod. Gamma scanning line located at -5m. 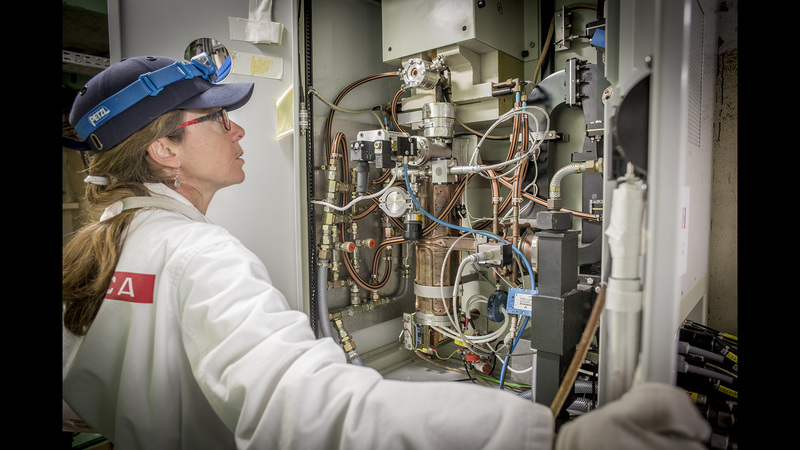 Nathalie Monchalin, technician at L2EP, the laboratory in charge of CIP tests, opened the box containing the electronic line of gamma scanning; the detector is located to her left. X-rays are generated by a linear electron accelerator located at two different levels of the facility. The accelerator bunker which generates the HF wave is located on level 0. The HF wave is transmitted using a wave guide to the X-ray head, located at -8 m and which is used to accelerate electrons that will reach a tungsten target creating X-rays by bremsstrahlung. The X-ray beam is produced with a dose rate of 13 Gy/minute at 1 meter and a maximum energy of 8 MeV. X-ray tomography uses the rotating movement of a device to obtain a quantitative mapping of the density over a cross section of the test device,X-ray radiography uses the traveling movement of the device. ​​Nathalie Monchalin (in the background) et Léna Lebreton at level-8m, next to the shaft where the rod will be put for nondestructive examination. 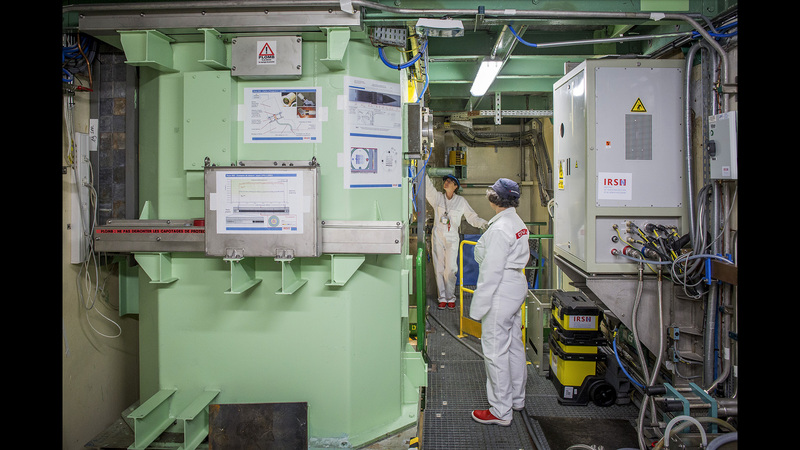 On the right, the box containing the head of X-ray generator from which the beam is directed towards the nuclear fuel rod. 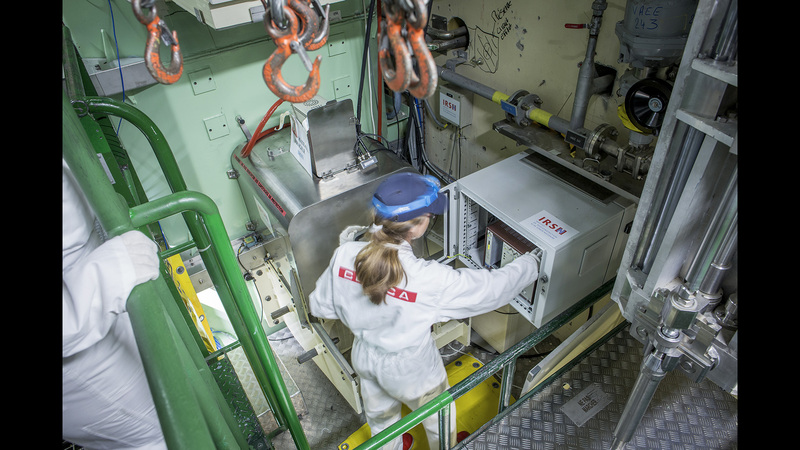 ​Nathalie Monchalin opens the box in which the X-ray generator is located. 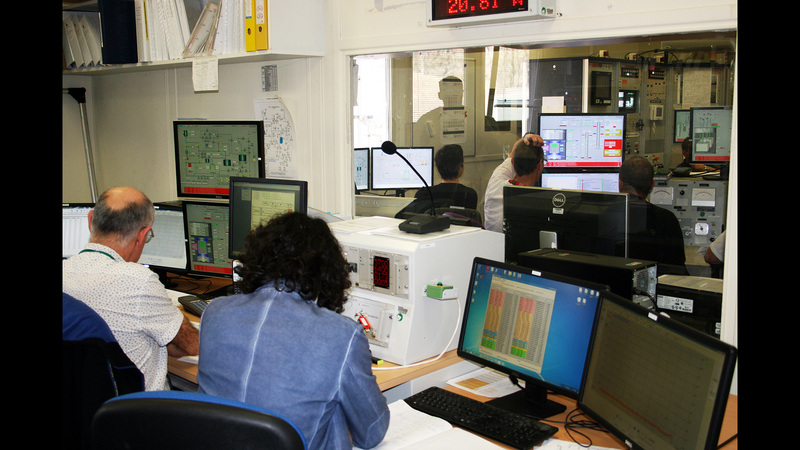 The control room located outside of the reactor building allows to analyze the test device before and after the test. ​Nathalie Monchalin in the remote control room of IRIS nondestructive measuring equipment from where the X-ray imaging of the rod i operated.